The Renegade Gardener was once involved with a delightful and charming woman he thought very possibly could be the one. She read good books, loved all types of music, hated Hollywood movies, preferred her Thai food hot and her beer cold. Best of all, she was hopelessly addicted to gardening. It was one of those relationships that went from zero to sixty in about four days. Then one day during the summer she and the Renegade were talking about garden design when she mentioned that she didn’t like lilies. Said it just like that, “I don’t like lilies. Don’t like the way they look.” Thinking back on it today, the Renegade Gardener realizes he can’t even recall her name. You have to love lilies! Their use is basically required in the herbaceous border. There are hundreds to choose from, in a variety of categories, and whereas there is a notion in some circles that they can be difficult to grow, the opposite is true. Growing lilies is easy. Lilies are bulbs plants, and though I’ve covered this before, it bears repeating: daylilies are not lilies. Lilies are the genus Lilium, while daylilies are genus Hemerocallis, and are in no way related. 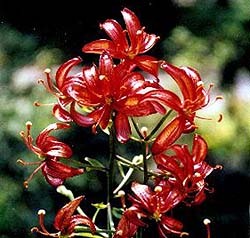 Asiatic lilies are derived from varieties native to Asia, and tend to be the easiest to grow. They are the most hardy (to Zone 2 with heavy winter mulching) and feature a wide variety of colors: white, red, yellow, orange, pink, even green. Most multiply rapidly and bloom over a long period from late June through July, with a few around as late as August. They like a nice sunny spot, at least five hours or more for prolific blooms. This will help you when you begin choosing Asiatics from fancy-schmancy catalogs. If the code given for the bulb is “1C,” that means it is an Asiatic (Division I) with a downfacing bloom. 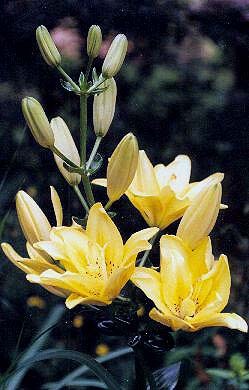 Martagon lilies are hybrids from wild varieties scattered from Europe to Siberia to Mongolia. Their chief asset is that they are a woodland plant, and do best in light shade. Mine get morning sun then afternoon shade, and they thrive. They are slower to multiply than Asiatics, and can go many years without need for division. They grow tall, four feet or better, and can carry up to 50 flowers on a single stem. Flowers are always pendant. Colors run the gamut, but also include creams, browns, dark purples, spotted and mottled. They are spring bloomers, April to May. Also known as Turk’s Cap Lilies. Reliable hardiness to Zone 3, and again, winter mulch after ground freeze is advised. Trumpet and Aurelian Hybrids are heavily perfumed with large blooms, growing very tall (4′ to 6′), which is why they are so spectacular. Many have the classic Easter Lily form. Trumpet colors range from white to yellow, gold, pink, purple, apricot, maroon, and every combination in between. Varieties bloom from mid-season to September. They are not as reliably hardy in the north, but merit experimentation and use. Oriental Hybrids come from wild varieties principally found in Japan and Korea. They are perhaps the most exotic in bloom, with flowers up to 10″ across, though they rarely pass 3′ in height. Smaller varieties are great in containers; pot in the fall, then place the container in the ground and mulch after ground freeze. Bring container back up and out in the spring, and the bulb will begin growing. Colors available in the north include white, pink and red (often with gold highlights) and spotted. Orientals are not the easiest to grow in the north, however, due principally to the fact that they bloom late (August into September) and thus mature late. Cold falls and early winters just don’t give them enough time to regenerate. They also have a harder time adapting to very hot summers. They also prefer acidic soil, more so than the other types, with a pH as low as 5.0. Work with the other lilies first, then give Orientals a try after you’ve had success. With lilies, the important thing is to get the soil right. Lilies need well-drained soil with a slightly acidic pH (Orientals lower, to 5.0) So you want do dig a hole at least 10″ deep and fill it with a mixture of good black dirt, organic matter (say 20% – 35%) and sharp sand, for drainage. If unsure about pH, get your mixture tested. Plant the bulbs 4″ to 6″ deep in the fall/early winter; they are not very fussy about this. Go at least 6″ deep in Zones 2 and 3, and with big bulbs, try them at 7″ deep. Like all bulbs, they prefer it dry after blooming. Space the bulbs at least 6″ apart. Do not fertilize. Fall is the accepted time to plant, and means the lilies will bloom when the books and catalogs say they will. 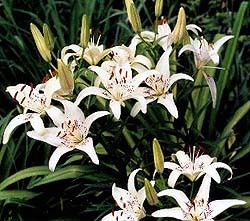 But you can also plant lilies in the spring – they’ll bloom that season, though later than normal. When the plants emerge, hit them with a balanced granular fertilizer, and repeat the application a month later. Don’t use a fertilizer with too much nitrogen. As the blooms fade, cut off the stems below the blooms and above the first set of leaves. At this time you can fertilize again, if soil is poor quality. Allow the stem and leaves to remain upright, don’t cut it down. I generally leave my stems alone until they are completely brown, the leaves withered. It’s a matter of taste, but I don’t like too many lilies in one clump. The better gardens I view always seem to have a striking lily or two here, a lily stem or three over there. Great waves of them just don’t seem as pretty as using lilies as more singular accents. Better gardeners dig up their lily bulbs and divide them every few years or so, so that their lilies remain lean and mean.